Last weekend I meant to write a post for Memorial Day. Unfortunately, a dose of food poisoning left blog posts way down on my to-do list. However, since I recently reinvented the calendar, I’ve no problem with rearranging a few special days as well. Leaving this Memorial Day post late for a few extra days has another benefit, Madame Weebles’s Hot Dead Guy Contest found a winner, Pierce McKennon. What, you didn’t know there was such a contest? Er, right, my bad, I should have mentioned it earlier. It was a brilliant idea to have a brilliant selection of dead guys and vote on them. Just in case that’s not enough brilliants in one sentence, here are a couple of extras for you to use as you please – brilliant, brilliant. Ok, back to the contest. In the final round, McKennon won out over some guy called Gary Cooper by a good margin. 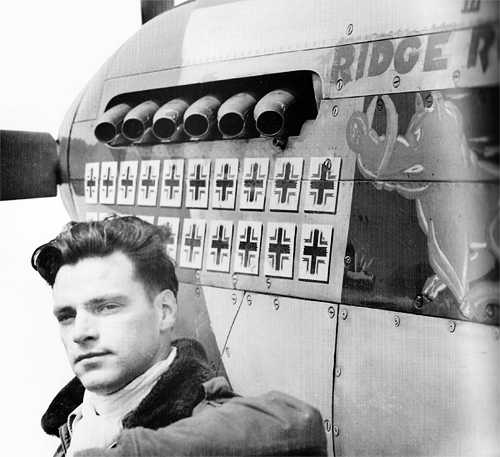 This cheered me up, because McKennon was a WW2 aviator – and not any old aviator, McKennon was a poster boy for service to your country, a fitting person to talk about on (a late) Memorial Day. So let’s talk about those attributes that put him in the winning position, “hot” and “dead. Ok, the dead part is easy. Yes he is, and at the mere age of 27. Tragically, he left a wife of less than a year and a child he never saw born. He died in a training accident two years after WW2 ended. Compared to his life in the war, he wasn’t doing anything particularly dangerous, just his duty. So, with “dead” out of the way, what about the “hot” part? Well yes, when it came to flying McKennon was hot. During WW2, he shot down 12 aircraft in aerial combat and destroyed another 10 on the ground. He flew for the Canadians and British before the US entered the war. After transferring to the US Army Air Force he flew Thunderbolts and Mustangs, commanded a fighter squadron, and survived being downed by enemy fire on two occasions. Only a few months later, in March 1945, McKennon was shot down again, this time in Germany. He was hit while attacking ground targets near Berlin and bailed out. 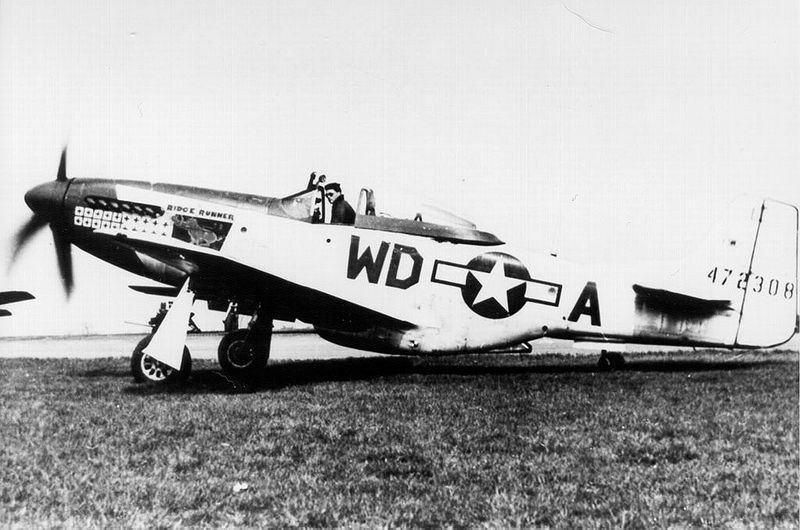 In fighter combat there is an adage that says speed is life, and the last thing a fighter pilots wants is to be on the ground and stationary, but Pierce must have been a popular guy because Lt George Green, his wingman, landed his P51 Mustang in a nearby field, and rolled to a stop to rescue McKennon. The two of them squeezed into the Mustang’s single seat by abandoning their parachutes. Green flew the aircraft with McKennon sat in his lap, and they landed safely back in England. Through these and other adventures, McKennon collected the Distinguished Flying Cross, an Air Medal, a Purple Heart, and the Croix de Guerre (Cross of War, from France). So there you have it, Pierce McKennon, definitely a hot pilot. PS If Pierce doesn’t float your boat, rumor is that Madame Weebles will be running a Hot Dead Chick Sweet 16 Tournament soon. Stay tuned (or logged in or whatever). Thanks, Nigel! And I’m sure Pierce would thank you too. You gave him a much more comprehensive tribute than I did, and he’s highly deserving of a great Blackwell write-up. To be sure, he was dreamy, but obviously a helluva good guy and a great pilot. And I do love the Mustang. Right up there with the P-38 and the Spitfire and the Hurricane. Have you done any tales of WWII fighters yet? Because if not, I will be here waiting to read and enjoy them. Thanks for the compliment today, glad you liked it. Sorry about the overlap with your post on the guy, I didn’t realize you’d already done a piece on him. WW2? No, I haven’t touched it yet, but I will do. And yes, the Mustang, Spitfire et al will be on the list. Excellent, I will look forward to future posts on fighter planes. It really is wild that we both wrote about the same guy without even knowing it. What are the odds??? What a great write-up – thanks! You reminded me of an author I discovered a few decades ago, and I think both you and Madame Weebles might enjoy him. His name is Donald Jack, and he wrote a series of fictionalized accounts that followed the exploits of a goofy Canadian who goes off to the trenches of WWI and rapidly makes his way into the RCAF. Jack is possibly the only author I know who can make you hold your sides laughing at a description of being caught up in an enemy convoy, driving a Rolls Royce Silver Ghost from which he recently evicted a headless body. The horrible realities of war are there, but the books are written with tremendous humour. The first book of his series is called “Three Cheers For Me”: http://www.amazon.com/Three-Cheers-Me-Volume-Papers/dp/0771043805/ref=sr_1_1?ie=UTF8&qid=1338821677&sr=8-1 (followed by “That’s Me In The Middle” and “It’s Me Again”. The series goes on to follow him through the end of WWI, civilian life, politics, the Russian conflict, WWII, Hitler, Stalin, and more. He reports a vast amount of historical detail in a way that’s both fascinating and funny. great post, Nigel. He is a honey. it is so ironic that a war hero died after the war, in routing activities. sure makes you wonder, doesn’t it? Yeah, to have survived all that he did then be killed in routine training is ironic. Sometimes its a good thing we don’t know what’s in our future. Very informative mini bio about a very interesting flying ace. Thanks! His story would seem perfect for Hollywood; maybe starring current hot live guy Ryan Gosling? LOL. So if I volunteer to write a story are you volunteering to screen the potential actors? Yes, food poisoning certainly can redefine agony! LOL, Daisyfae! Now there’s a list to create. I’m sure your brain is pretty good where it is, I’d hang onto to it a while longer. BTW, breathing into a brown paper bag may help with the fainting thing. I told daisyfae that I think she’s inspired a new feature on Fear No Weebles, unless she wants to keep it for herself, which of course is her right since it’s her crazy brilliant idea. Wow! Pierce is definitely one very hot dead guy. I think I’m going to have to print out that picture and pin it up in my office for my writing breaks. Thanks for educating me about this brave and admirable fellow. Sorry you had food poisoning–no fun at all. I hope it was from a food you don’t much like anyway. I still can’t eat at a restaurant where similar “events” followed. Is a hot dead woman contest in the works?? Hi Nigel. Thanks for another great story. I’m guessing that Marilyn Monroe will win the hotest dead chick contest. Miss Monroe might just win. Things haven’t been the same at presidential birthdays since she passed away. Chick selection is up to Madame Weeble, so you might want to put in a vote! Dammit! This guy looked just like Ricky Martin! Ha! There is a bit of resemblance there! My father witnessed McKennon’s rescue that day from his Mustang. He loved telling the story. I have always admired McKennon, hell of a fighter pilot. You’ve made my day, George. Sometimes, it’s an amazingly small world. I’m sure it was a great story to hear firsthand. And I’d guess if your father witnessed McKennon’s rescue that’s not the only good story he had to tell. Was your father perhaps George E Ridler? I can’t believe I didn’t see your response. So a belated thank you for that. Yes, my father was George E. Ridler.